Could there be anything "better than Antioch"? Is that not a loaded question? After his subjection of the city in 540 AD the Sassanid King, Chosroes took the population of the city (supposedly in its entirety) off to his kingdom where he built for them a new city near Ctesiphon under the name of Veh-az-Andiv-Khusrau ("Khusrau's Better-than-Antioch"). Some reports include the juicy detail that he even took the flute-players,mimes and charioteers. He certainly knew the way to his captives' hearts! In George Rawlinson's The Seventh Great Oriental Monarchy (London, 1876, p. 395)he writes: “The Persian prince [Khosru I] after the fall of Antioch passed the winter in building and beautifying a Persian Antioch in the neighbourhood of Ctesiphon, assigning it as a residence to his Syrian captives, for whose use he constructed public baths and a spacious hippodrome, where the entertainments familiar to them from their youth were reproduced by Syrian artists. The new city was exempt from the jurisdiction of Persian satraps, and was made directly dependent upon the king, who supplied it with corn gratuitously, and allowed it to become an inviolable asylum for all such Greek slaves as should take shelter in it, and be acknowledged as their kinsmen by any of the inhabitants. A model of Greek civilization was thus brought into close contact with the Persian court." Rawlinson adds in a footnote: "Here the Oriental accounts are in entire accord with the Greek. Mirkhond and Tabari relate at length the construction of this new Antioch in the vicinity of Al Modain, adding that the name given to it was Rumia (Rome), and that it was an exact copy of the town upon the Orontes". 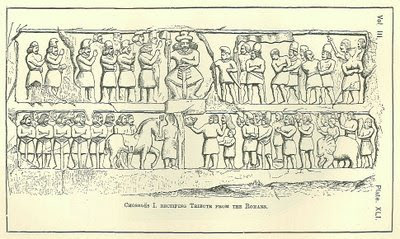 In the history of the Sassanids, translated from the Persian of Mirkhond by Silvestre de Sacy, it is said of Nauschirvan, one of the Persian monarchs who resided at El-Madan, a city built on the ruins of the two famous ones of Seleucia and Ctesiphon, after describing his conquests in Jezireh or Mesopotamia,—" II fit pareillement la conquete de Kennasserin et d'Alep, villes de Syrie. Lorsqu'il fut arrive pres d'Antioche, la plus belle ville de la Syrie, elle lui plut tellement, qu'il la fait dessiner sur un papier, et ordonna qu'on en construisit une absolument pareille, sans la moindre difference, a peu de distance de Madain. Cette ville fut nommee Roumia; et quand elle fut achevee, Nauschirvan ordonna a tous les habitans d'Antioche de se transporter dans sa nouvelle ville. Les rues, et les places de ces deux villes, se ressemblerent si parfaitement, que chacun des habitans d'Antioche, une fois entre dans la ville de Roumia, se rendait, sans y penser, a sa maison. On dit qu'il n'y avait autre difference entre ces deux villes, si ce n'est qu'un blanchisseur de toiles, qui avait un arbre dans la maison qu' il occupait dans l'ancienne ville, n'en trouva pas dans la nouvelle. Ce trait est un de plus singuliers que l'on connoisse. "—De Sacy, Memoires sur les Antiquites de la Perse. 4tO. Paris, 1793. p. 366. This is an intriguing (and confusing) story because as this comment would seem to indicate the new city was reportedly an exact replica of Antioch. De Sacy here talks of Nauschirvan as the relocator of the population and builder of the "new Antioch". How the replicated city plan could be possible is still not clear unless all he did was repeat the street plan. He certainly did not have a Mt Silpius at his disposal on the banks of the Tigris. What would excavation of this site (now in Iraq) reveal about the street layout of Ancient Antioch? Warwick Ball in his book Rome in the East states that the population of the new city was around 30,000. Chosroes may have thought this "Better than Antioch" but really it must have been a pale shadow. Well, in 540 ce antioch also was a pale shadow of itself 400 years before.